RAS genes code for four isoproteins: K-RAS4A, K-RAS4B, H-RAS and N-RAS, which share 82%–90% sequence identity (figure 1).6–8 These proteins act as a link in the intracellular signal transduction initiated by binding growth factors to cell membrane receptors.6 8 They help mediate signals related to cell survival, senescence and others.6 8 Despite their shared similarity, there is compelling evidence that RAS isoproteins have distinct functions in different tissues in both health state and cancer.6–8 The differences in function are at least partially attributed to the differences in the C-terminal hypervariable region of these proteins. The basic structure of the KRAS gene (upper diagram). The exons represented by the blue rectangles are the ones that code for proteins. Differential splicing to either include or exclude exon 4a results in the two KRAS isoforms: KRAS4A and KRAS4B. The recommended exons to be included in testing in the previous and current guidelines are highlighted. The lower diagram shows the basic KRAS protein structure with two domains; the G domain (GTP binding domain), which is similar between the four RAS isoproteins (per cent similarity shown, 100% for first 85 amino acids and ~85% for the whole G domain) and the hypervariable region with CAAX motif at the end, forming the membrane targeting part of the protein. Although RAS proteins interact with several effectors, the two major signalling pathways through which RAS proteins exert their function are mitogen-activated protein kinase (MAPK) and phosphoinositide-3 kinase (PI3K). Discussing these pathways is beyond the scope of this review. Figure 2 shows a simplified summary of the RAS protein as a signal transducer and its interaction with the various intracellular effectors, focusing on the MAPK and PI3K pathways. The role of RAS protein as a signal transducer connecting to multiple downstream effectors. The two downstream effector pathways commonly involved in colon cancer pathogenesis and known to mediate cell survival are further detailed. AF6, Afadin, AKT, protein kinase B; eGFR, epidermal growth factor receptor; ERK, extracellular signal-regulated kinase; Gab2: Grb2 associated binding protein 2; GDP, guanosine diphosphate, phospholipase C; GF, growth factor; GTP, guanosine-5'-triphosphate; MEK, mitogen-activated protein kinase; Pi3K, phosphatidylinositol (3,4,5)-trisphosphate; PKC, protein kinase C; RalGDS, Ral guanine nucleotide dissociation stimulator; RAF, rapidly accelerated fibrosarcoma; RIN1, RAS and RAB interactor-1; Shc, Src homolog and collagen; SOS, Son of Sevenless; TIAM, T-lymphoma invasion and metastasis inducing protein. Extended RAS testing in the current guidelinescompared to previous recommended testing. RAS genes are the most commonly mutated genes in human malignancy, found in 25% of all cases. The four RAS isoproteins (KRASA4, KRASB4, NRAS and HRAS) share approximately 80% sequence identity, yet thought to have different roles in health and malignancy. RAS proteins act as a link in the signal transduction induced by growth factors to promote cell survival. KRAS and NRAS genes are mutated in 52% of patients with colon cancer, with most of the mutations affecting exon 2. KRAS mutations have a role in both the development and progression of colon cancer. According to the latest NCCN guidelines, testing for RAS mutations should be done for all patients with metastatic colon cancer disease. Testing is preferably performed on metastatic lesions using formalin-fixed, paraffin-embedded tissue. But cytology specimens can be used after proper validation. Various testing platforms can be used if they are validated and meet clinical standards. Testing RAS mutations in liquid biopsy is showing great promise and might replace traditional tissue testing in the near future. Only patients with wildtype-RAS genes should be considered for anti-EGFR treatment. Even though decades of research have failed to produce an effective and safe RAS targeted therapy, promising clinical trials are on the way. RAS proteins have always been thought of as potential therapeutic targets due to their critical role in the development of many malignancies including colorectal cancer.39–42 Despite that, more than three decades of research have failed to produce an effective and safe drug that can target RAS proteins.43 This failure is at least partially attributable to the biochemistry of RAS proteins. RAS proteins have a relatively smooth shape that hinder drug attachment, rendering direct targeted therapy difficult.43 Figure 3 shows some of the key categories of direct RAS drugs/experimental molecules and their timeline since RAS discovery until now. 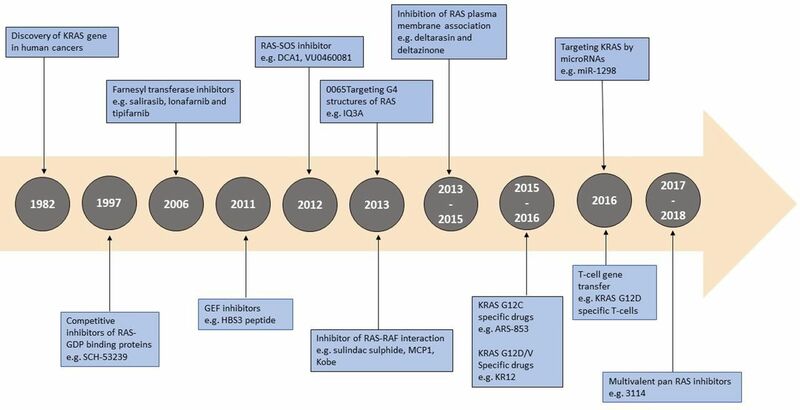 The timeline for the key direct RAS drugs since the discovery of RAS gene mutations in human malignancy and until now. This is not meant to be an exclusive list of the large number of experimental drugs that have been discovered, but a simplified timeline for the main drug and drug categories. Testing should be done in all patients with metastatic colon cancer disease considered for anti-EGFR therapy. Testing is preferably performed on metastatic lesions using formalin-fixed, paraffin-embedded tissue or cytology specimens after proper validation. Testing should include mutations affecting exons 2, 3 and 4 in both KRAS and NRAS genes (extended RAS testing). Mutations in KRAS and NRAS are seen in approximately 52% of colorectal cancers, commonly involving codons 12, 13 and 61. RAS gene structures and functions have been thoroughly studied and described since their discovery decades ago. Their role in the pathogenesis of malignancy, including colon cancer cases, has been supported by many studies including animal models. The extended testing for KRAS and NRAS mutations is now the standard of care in patients with stage IV colon cancer considered for anti-EGFR monoclonal antibodies. 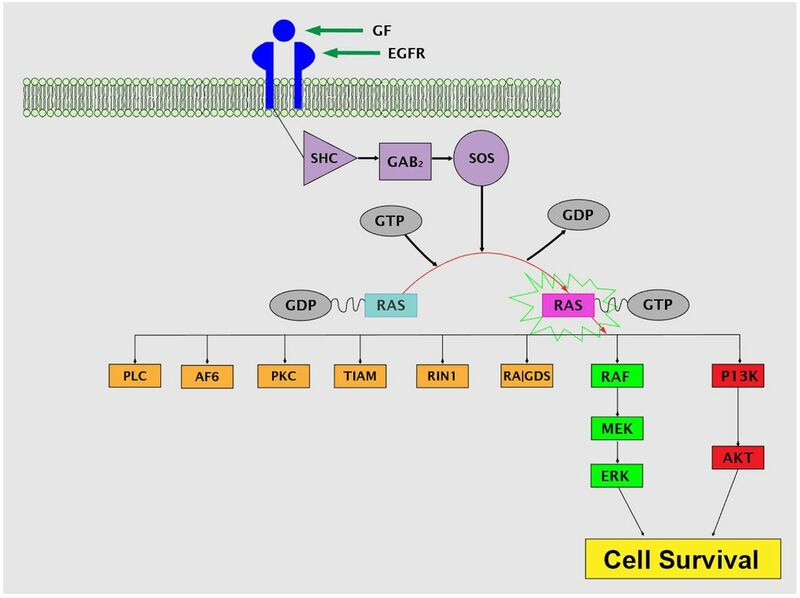 Despite decades of futile attempts to synthesise a safe and effective RAS targeted therapy, the last few years showed a renewed interest and significant progress on new and novel approaches to target KRAS mutated tumours.
. Cancer statistics. CA J Clin Phys 2018;2018:7–30. NCCN clinical practice guidelines in oncology (NCCN guidelines): colon cancer Version 2. Vol. 2018, 2018.